Sarah Chapman Skinesis Overnight Hand And Nail Treatment | £36 // I’ve got a full review of this coming up next month so I’ll only talk about it briefly here but let me just say I wish I had saved my money for something else. It is the scent that I just cannot stand and although this isn’t the most important thing about a product, when you’re spending over £35 on a product and the scent makes you do not want to use it, it’s not very good. The actual product itself is ok but nothing amazing and definitely not worth the price in my opinion. It’s one of those oils that feels like it’s just sitting on the top of your skin and never really sinks in. It’s an overnight treatment and I’m ok about going to bed with slightly tacky hands but completely greasy is a step too far. I just wish I had smelt and tried it in person before I bought it! Kiehl's creamy avocado eye treatment | £33 // This is another one I wish I had tried in a store first before I bought it. I was at my wits end with the eczema around me eyes so I was pretty much ok with trying anything. This cream had been raved about my countless people and some who had similar issues as me with dry skin and allergic reactions around their eyes. It’s way too heavy and thick for me to use on a daily basis, but I hoped it would be good as a sort of treatment when I needed it. I think the main problem for me is how it sinks in. It’s quite hard to describe but as you’re patting/rubbing it in it almost feels like it turns into water and that it’s never going to sink in. You’ll probably only understand this if you’ve tried it. I bought the larger tub as it was the only one in stock and I really wish I had either waited or bought it in store as I’m never going to finish this and I hate wasting products. 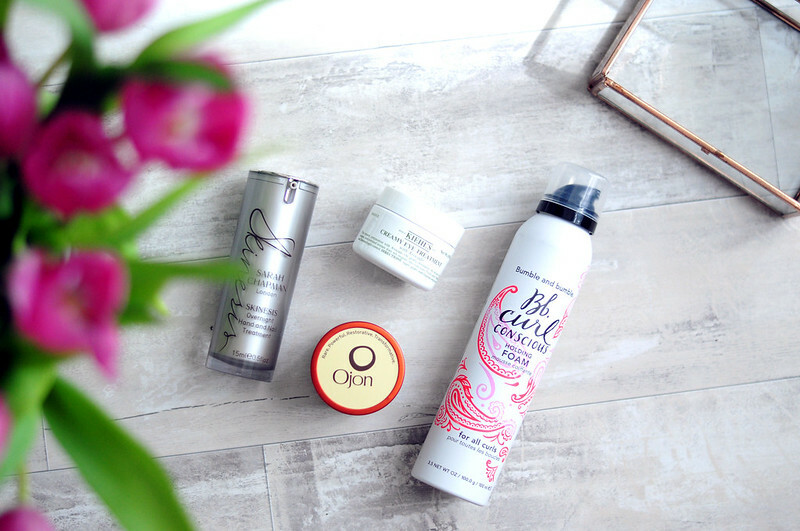 Ojon Damage Reverse Restorative Hair Treatment Plus | £19 for 50ml or £34.50 for 100ml // This is another one people had raved about and I was really disappointed in it especially considering how little product you get for the price. In the pot, it’s a solid oil that you’re meant to warm up in your hands and apply it to dry hair once it has turned into an oil. No matter how hot my hands are, I always struggle with this turning into an oil and am usually left with chunks of balm throughout my hair as it’s almost impossible to distribute evenly. It also smells horrible and I can never really tell a difference to my hair after I’ve used it. Bumble And Bumble Curl Conscious Holding Foam | £23.50 // I ran out of the curling mousse I was using a month or two ago and I fancied a change so I went searching the internet. Despite reading through pretty much all of the hair posts on The Beauty Department, I couldn't really find the exact product I was looking for. I knew I didn't want a cream and instead wanted a mousse that would enhance my natural curl which is pretty hard to find. After a look on Space NK, I ordered the Sachajuan Hair Mousse as well as this one from Bumble And Bumble. The description of the product looked promising and it sounded a bit like the KMS foam mousse I was using before and liked. What: Keep curls together regardless of heat or humidity with flexible, durable hold. Who: A must for curly types in need of more hold and structure. When: After using Smoothing Shampoo and Conditioner or Nourishing Masque. How: Dispense a pea-size amount and activate in hands; apply to damp hair from the nape forward, roots to ends; heat-style or air-dry. So I washed my hair and let it towel dry for ten minutes or so. I then followed the instructions, I must have only used a tiny amount, but I found it pretty much impossible to distribute evenly throughout my hair. Since my hair was damp I couldn't really tell how it would work so I let it air dry. After a couple of hours there was parts of my hair that still weren't dry which was a bit odd and when I touched my hair it was really sticky in the parts where I obviously wasn't able to distribute it properly. All I could do was go rinse it out and use a different product. I decided to try it again a couple of weeks later and the same thing happened. I hate the thought of just throwing away a product I've spent over £20 on, but I really can't see a way of using it. I also wouldn't describe it as a foam. Despite trying to "activate" it, it just stayed as a sticky gel. You can read about the other products that have disappointed me here. For your eyes Bare Minerals has a Mineralixirs Oil Eye Balm (or something like that) that works quite good for me on both eyes and lips (though I've got psoriasis, not eczema). I've considered buying that Kiehls eye cream for ages as as you said so many people rave about it but that consistency really doesn't sound appealing! I hate eye creams that don't sink in immediately! I didn;t get on with the eye cream either! Agree on the Ojon. The only noticeable thing is that my hair smells like a mixture of coffee and tobacco that last for about two washes. Waste of money and time!